I love a good traybake – both the cake version and the meal kind. 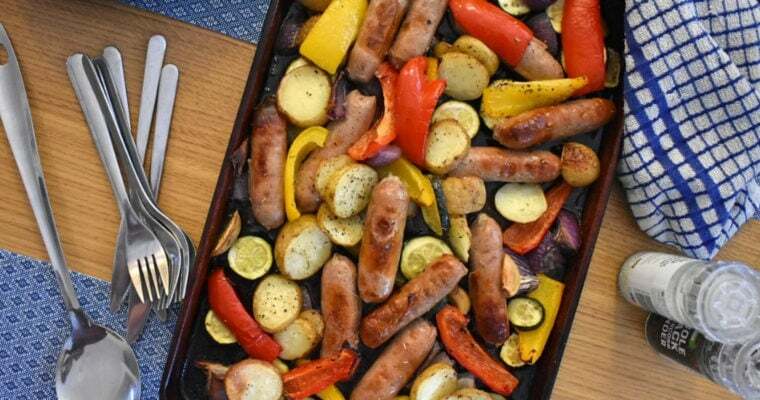 There’s nothing better than throwing loads of potatoes, vegetables and meat on a tray, drizzling on some oil and herbs and baking it in the oven. There’s loads of flavour and colour, minimal work and hardly any washing up. 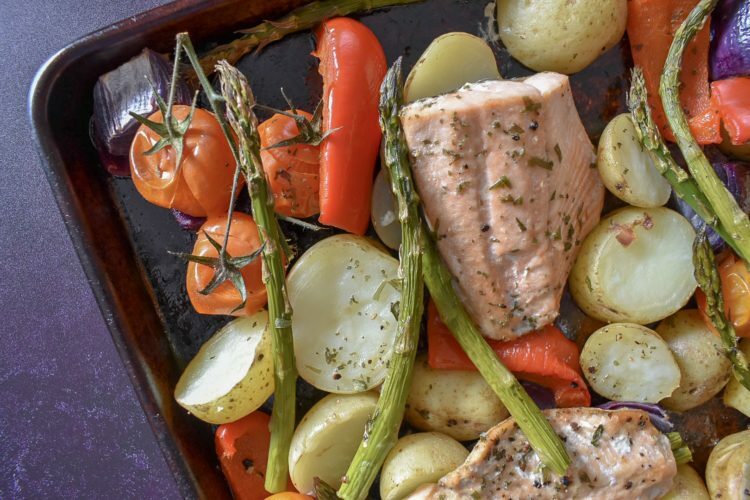 In the case of this Simple Salmon Traybake, it also smells absolutely incredible when it’s cooking. I really love salmon, but we don’t do anywhere near enough with it. I’m a bit fussy, I don’t like it on it’s own, but I don’t like it with too powerful a sauce either. I need something quite delicate. 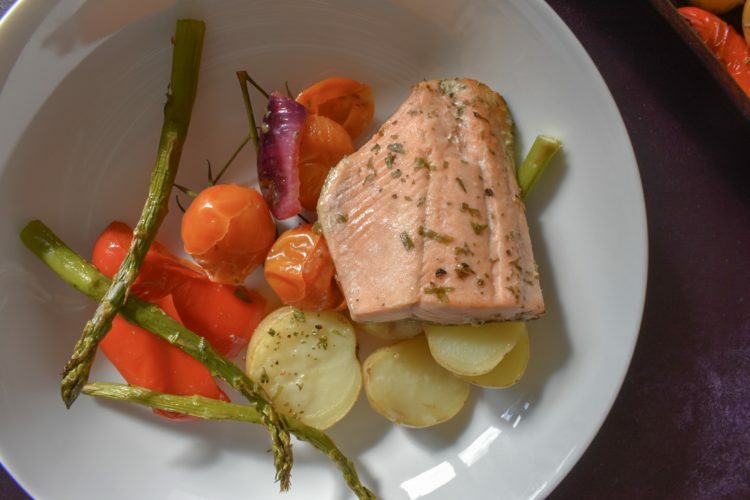 That’s why a Simple Salmon Traybake is perfect. You can pretty much add what you want. I go for a little drizzle of oil to make sure everything cooks well and crisps nicely. Then I add a little tarragon and parsley, which I think work fantastically well with fish without overpowering each other. Then just a little salt and pepper to finish. I tend to use frozen salmon fillets, because they’re cheaper, and good to have in the freezer when you need a quick and easy meal. Frozen fillets usually cook best from frozen. So, I put them in the oven at the same time as everything else, and give it all a good oil and herb drizzle. 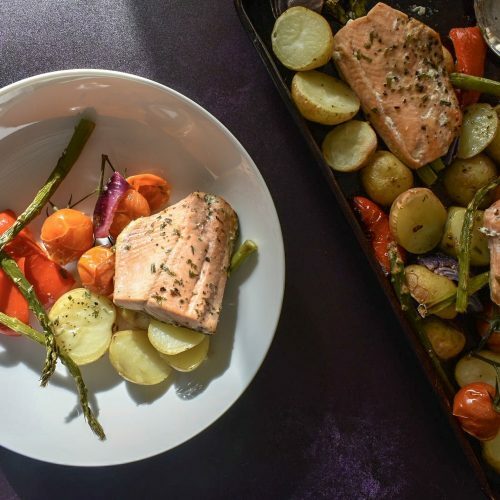 If you prefer to use fresh, bake everything else for 20minutes first and add the salmon later, you can always add a little extra oil and herbs to help flavour it as it cooks. An incredibly healthy midweek family dinner that doesn’t skimp on flavour. I often use frozen salmon fillets, in which case I nestle them on before the first bake and before drizzling with oil and herbs. Bake for 40 minutes in one go until all cooked.